True story: I’ve made this tangerine cake three times already. Yep. Three! To say I’m in love with this loaf is an understatement. I’m pretty obsessed with all things citrus and I’m also currently having a moment with quick breads which is how this baby came to be. 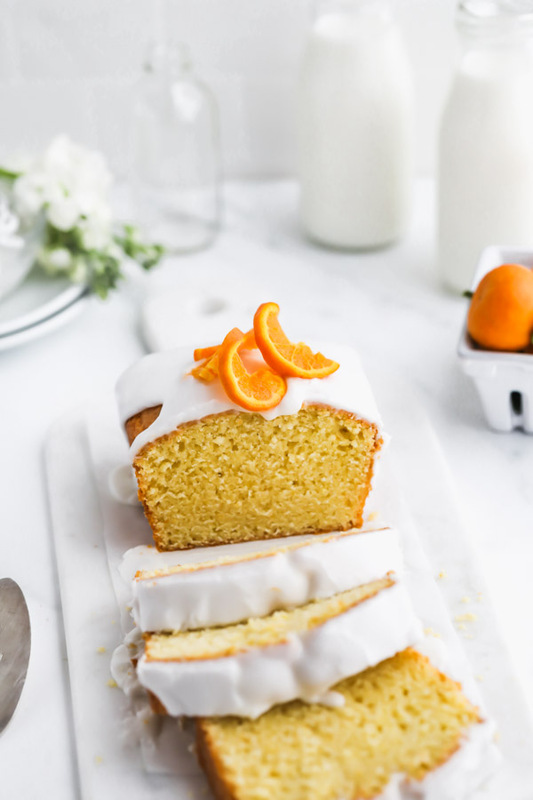 Baking with citrus is nothing new around here. Meyer lemons, blood oranges, key limes….you name it, I’ve baked with it. 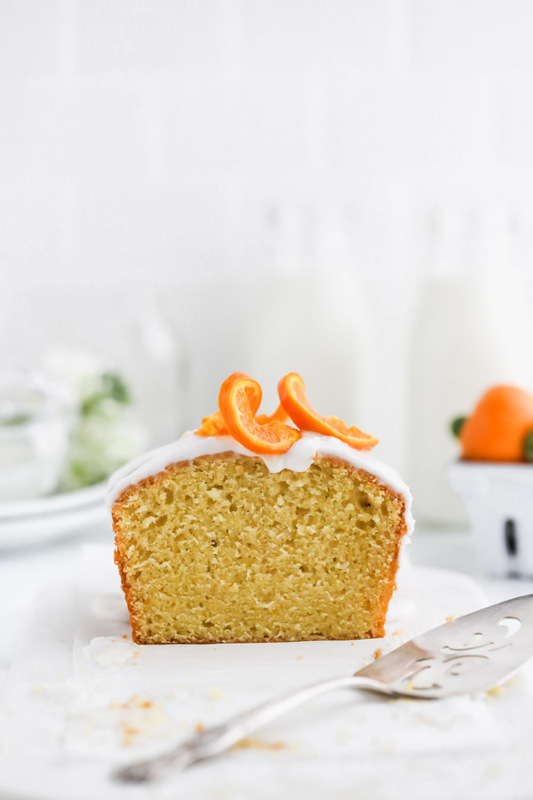 Be sure to check out my favorite Meyer Lemon Poppyseed Cake here. It’s sure to be a household favorite! This time I traded lemons for tangerines and let me just say that the results are nothing short of amazing. 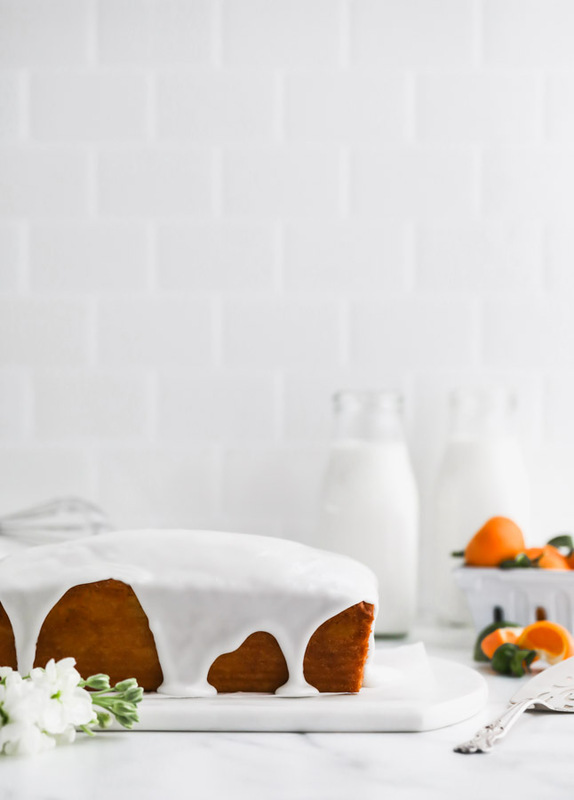 This Glazed Tangerine Cake is one of those recipes that you’ll want to file under breakfast AND dessert. I for one will wake up at the crack of dawn any day for a slice of this dreamy cake. Tangerines are pretty available in most markets this time of year. I used Golden Nugget tangerines for this cake. Golden Nuggets are a close cousin to the Satsuma tangerine and both are part of the Mandarin family. They are subtly sweet, seedless and their skin is tighter than that of a Satsuma. They are great for baking as they yield a fair amount of juice considering their tiny nature. And the fact that there are no seeds to get in the way is a major bonus! 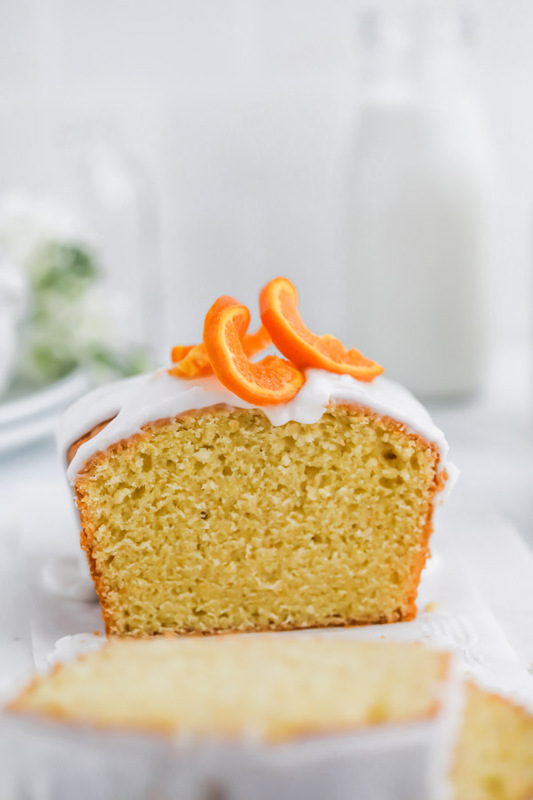 If you make this Glazed Tangerine Cake or any other sweet treat from the blog, be sure to tag @brownedbutterblondie on Instagram. I love to see what you’re baking up in your kitchen. 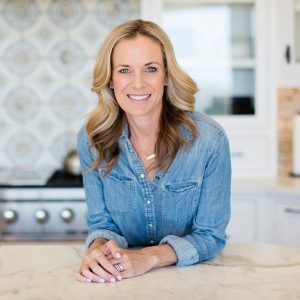 And be sure to follow along on Pinterest for the latest recipe details straight from the blog. To save a recipe to your own Pinterest board, simply click on any one of the red “SAVE” buttons on any photo in the post. Happy baking bakers and I’ll meet you back here on Friday for a classic chocolate chip cookie recipe you won’t want to miss! 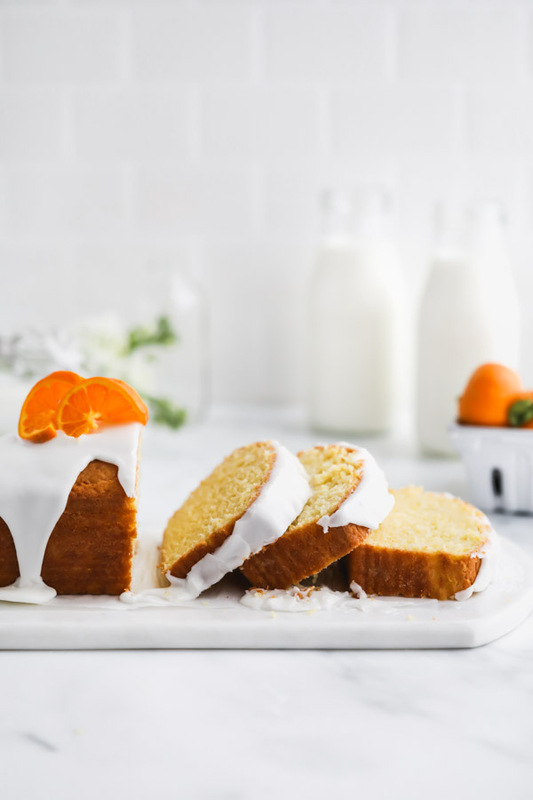 A light and fluffy citrus cake drizzled with a tangy yogurt glaze. This breakfast loaf infused with both tangerine juice and zest is the perfect addition to Sunday brunch. Grease a 9 x 5 loaf pan with nonstick cooking spray and line bottom and sides of pan with parchment paper. In the bowl of a stand mixer fitted with the paddle attachment, cream together sugar and butter on high speed until pale and fluffy, about 3 minutes. Add eggs one at a time, mixing on medium-low speed until fully incorporated. Add vanilla extract, tangerine zest and tangerine juice. In a separate bowl, whisk together flour, salt, baking soda and baking powder. With mixer on low speed, add flour mixture in three batches, alternating with the Greek yogurt (beginning and ending with the flour mixture). Pour batter into prepared pan and use an offset spatula to carefully level the top. Tap pan firmly on countertop three times to release air bubbles. Place in center rack of oven and bake for 55-60 minutes or until a toothpick inserted in the top of cake comes out clean or with few crumbs remaining. Cool on a wire rack for 20 minutes before removing from pan to cool completely. Once cake has reached room temperature, add glaze to top of cake and allow to run down sides. Combine all ingredients in a medium size bowl. Whisk until glaze is smooth and thin enough to pour onto cake. If too thick, add more milk 1 TBSP at a time. If too thin, add more confectioner's sugar. Store leftover cake tightly covered in a cool, dry place. SO fresh and perfect for spring!! It really is! Thanks Kasey! !